The Virginia Space Grant Consortium (VSGC) is a coalition of five Virginia colleges and universities, NASA, state educational agencies, Virginia’s Center for Innovative Technology, and other institutions representing diverse aerospace education and research. Learn more about VSGC here. Internships: The Commonwealth STEM Industry Internship Program (CSIIP) offers year-round internships for Virginia undergraduates in STEM fields. Register today! 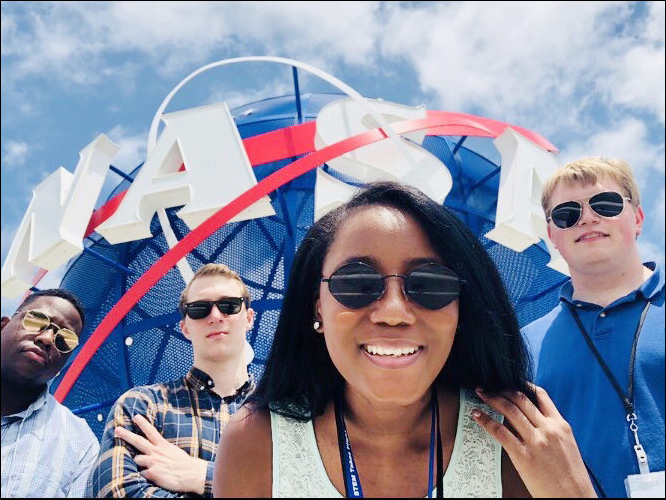 The deadline for STEM Takes Flight NASA Research Experiences, for Virginia Community College students, is February 26, 2019. Scholarships: Visit our scholarships and fellowships page! 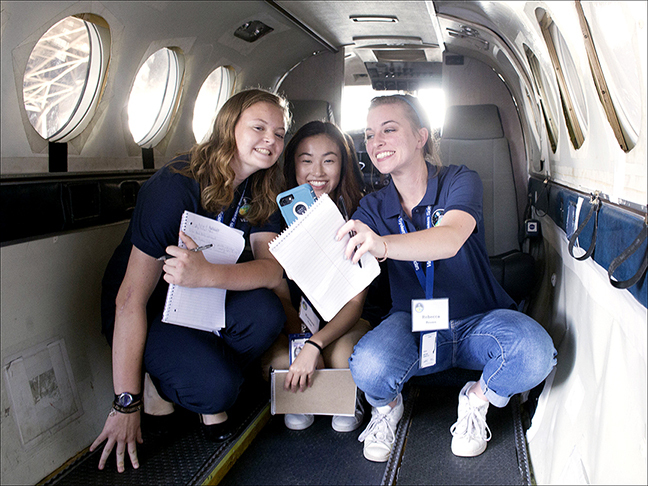 High School Programs: Application deadline is in November 2019 for the 2020 programs of VASTS, VESSS and Virginia Space Coast Scholars. Read more on the Virginia CubeSat Constellation website here and in the attached press release. 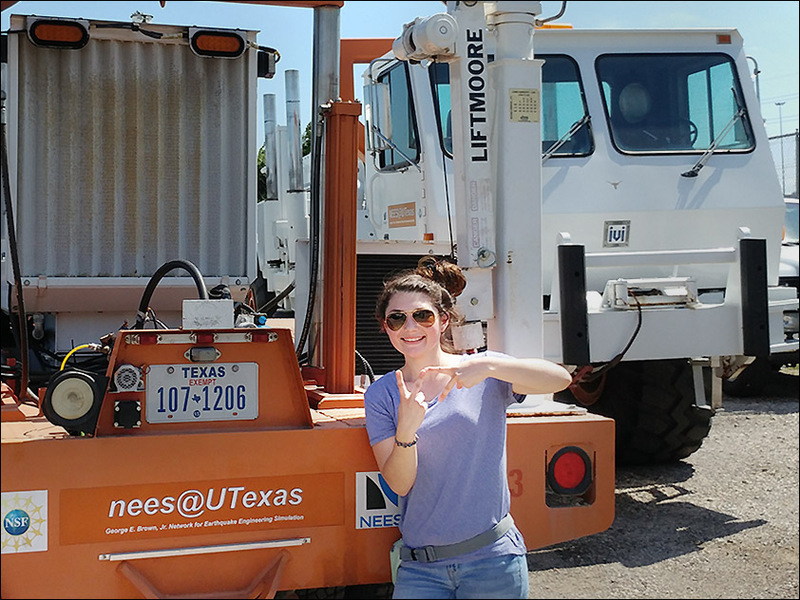 Morgan Re, this summer at NHERI, standing in front of the mobile shaker used to test the RAPs in-situ at the Christchurch, NZ site. EDUCATION: Double majoring in Biological Systems Engineering and Professional and Technical Writing, minoring in Geosciences and Horticulture at Virginia Tech. Read more about Morgan Re here. In 1987, a joint congressional study panel met to address a number of issues facing the aerospace industry and the Nation, among them a looming shortage of workers prepared for a high tech workforce and a decline in scholastic achievement, especially in the disciplines of math and science. Congress was also concerned with building research infrastructure at our Nation’s institutions of higher education. Congress passed legislation in 1988 which established the National Space Grant College and Fellowship Program. The Virginia Space Grant Consortium received its designation from NASA in 1989. You can visit NASA’s National Space Grant website here. The VSGC advisory council includes representatives from each member institution who serve as the liaison for their respective institution. Members include Old Dominion University, Virginia Tech, William and Mary, University of Virginia, Hampton University, the Virginia Community College System, the Virginia Department of Education, Virginia Air and Space Center, Science Museum of Virginia, ODU Research Foundation, NASA Wallops Flight Facility, NASA Langley Research Center, MathScience Innovation Center and Center for Innovative Technology. Mission Statement: The Virginia Space Grant Consortium acts as an umbrella organization, coordinating and developing quality aerospace-related, high technology, educational, workforce development and research efforts throughout the Commonwealth. Vision: To serve as a catalyst for, and partner in, the enhancement of aerospace-related and high technology education, workforce development and research in the Commonwealth to foster enhanced quality of life for Virginia through workforce development and increased public science literacy.